The deluxe second edition of the popular Society of Ancients game is now available for order. 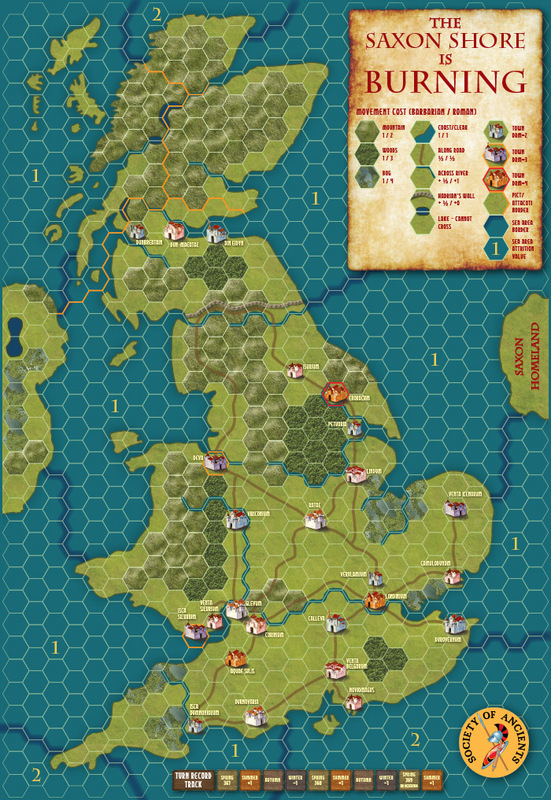 With the mapboard and counters now doubled in size, the counters printed on extra-thick board, and the artwork completely redone, you have a game that gives full value for its price. 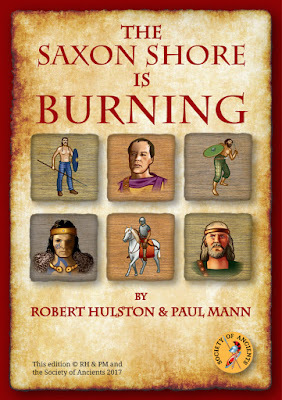 This is a two-player simulation of the Barbarian Conspiracy of 367 A.D. Against Roman Britain. In that year the Scotti of Ireland, Atacotti of Western Scotland, Picti of Eastern Scotland and the Saxoni of Upper Germany/Lower Denmark joined forces to take advantage of the withdrawal of the province’s three legions to the continent in one of the interminable Imperial Succession disputes. Britain was rich and prosperous but under-defended, so the Barbarians were able to loot and pillage up and down the country, running riot and killing the Count of the Saxon Shore. The Romans were eventually able to restore order and by 369 A.D. the province was secure again, though permanently weakened. A 6-sided die is also required. The counters are printed in thick card and will require cutting out. They are one-sided and do not need to be glued back-to-back with each other. The game is designed for 2 players, but may be played by 3, 4 or 5 players. there is one Roman and four Barbarian factions: Scotti, Picti, Atacotti and Saxoni. One player takes the side of the Romans, the others take the side of the Barbarians. 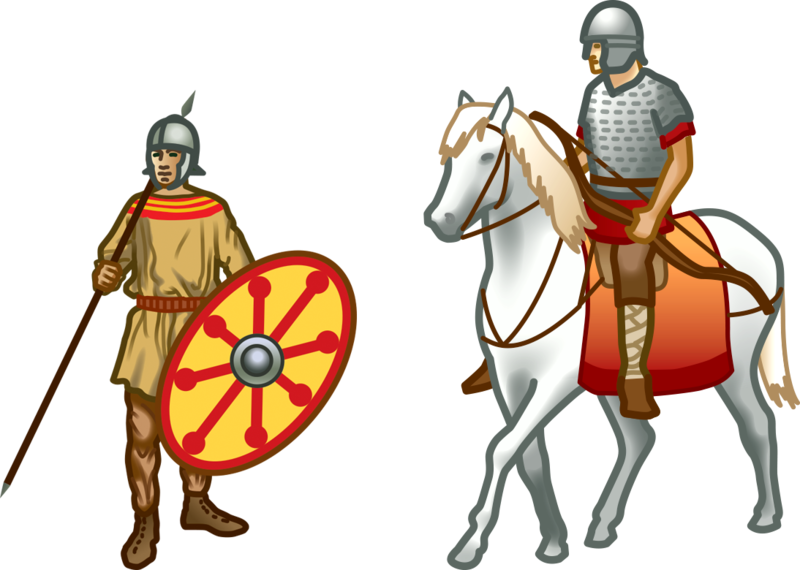 In a 2-player game the Barbarian player will control all the Barbarian factions. In a 3-player game one Barbarian player will control the Scotti/Atacotti and the other the Picti/Saxoni. In a 4 player game one Barbarian player will control the Scotti, one the Picti and one the Saxoni. Barbarian players dice each turn for control of the Atacotti. In a 5-player game each Barbarian player controls one of the 4 barbarian factions. At the beginning of the game the Roman player has at his disposal a single fleet, two commanders (one Dux and one Comes), 36 steps of infantry and 24 steps of cavalry, and initially controls all the towns. He is also able to set up 23 forts along the coastline in Roman territory. Each Barbarian faction has one chief and 40 steps of infantry. The Scotti and Saxoni each have three fleets whilst the Atacotti and Picti each have two. The Roman are thus heavily outnumbered but start from well-fortified positions. The game lasts for 10 turns. The objective of the Barbarian player is to destroy as many Roman towns and forts as he can, and demolish Hadrian's Wall, whilst the Roman player must hold on to as much as possible until the end of the game. A turn sequence incorporates attrition for units in woods or bog, lightning strike raids by Barbarian troops transported by fleets, overrunning of small detachments by larger forces, pitched battles, desertion of demoralised Roman troops, the sacking of towns and forts, and the arrival of reinforcements. Roman commanders and Barbarian chiefs play their part in organising attacks and contributing to their forces' combat factor. Combat can be resolved either by dice or by using 'scissors-paper-stone' (quicker and more fun). The game plays to a tense finish, as the Romans yield as slowly as possible, using their cavalry and strong fortifications against a numerically superior foe until the last turn of the game, when the legions finally arrive from the continent to save the day. The game is available for £15 (£12 for Society members) from the Society website. Click here for more details. And happy gaming!